Starting with Western New York, We have finally had enough Snow and rain to at least temporarily raise, the water flows in all our rivers and creeks. Hopefully we will see a late run of Brown trout and an early run of winter steelhead. This would make for a nice mixed bag of fish. This has been challenging week, with cold weather, wildly fluctuating water flows and grumpy fish. Well, it is that time of year. There is a lot going on with the fishing conditions this time of year. We need to just dell with it, and think our way through a tough day of fishing. We now have had A month of brown trout spawning in our rivers and creeks. This means there are plenty of spawned out Brown trout looking for big bites of food. For us this means two things, First the streamer fishing is definitely turning on. The second consideration is that, the trout are now using more of the rivers. The pool fishing is becoming more productive, more water to hunt through to find a fish. For the productive flies, we are still using our favorite egg flies. But now we are expanding our fly box to include A few woolly buggers in colors of black, brown and white, plus a few white and gray streamers. The Salmon River, water flows have finally increased. Water flow release at the damn is at 750 CFS plus run off. This will definitely freshen up the fishing and keep the steelhead fishing at a good pace. Keep in mind I do not expect the steelhead fishing to be overly easy. I have been rating the fishing as above average to excellence but technically demanding. This means if you know the river, the steelhead you will do just fine. As of now with the winter weather starting to settle in and water temperatures dropping, the steelheads are now moving into their winter water. This also means we need to slow down our presentation. Both when using dead drifting techniques and swinging techniques. For productive flies, with this increase in water flows, the egg bite is going to be strong through this coming week. Stay with your favorite egg flies and size 12 through 8 and in your favorite colors. Do not be afraid to experiment with both fly size and color. Keep in mind that we did have a light run of salmon this fall, as result there is not as many eggs in the system. The swing fly has been more productive this fall than in years past, Especially in the lower river. Both bunny style and intruder style flies have been very productive. As always keep these styles of flies no larger than 3 ½ inches for best results. We had a big change in the weather and with the fishing. This cold snap changed everything in a big hurry. All of the creeks and river are going through the same changes, rapidly plummeting water temperatures. Instead of talking about what has been going on with the fishing. This time I will talk about how to deal with the changes. Hopefully you’ll find this helpful the next time you are on the water. late fall, early winter, can be a challenging time to fish. This is mostly due to constant fluctuations of water temperatures. At this time of the year, water temperatures can fluctuate as much as 10° in the smaller creeks. A temperature of just 3° can almost shut the fishing down. This may sound like a nine productive time to fish. But we need to keep two things in mind. First we fish when you get a chance and second is during cold snaps we need to adjust our fishing to what the fish are actually doing. In our case the fish are moving from there fall water to there winter water. This movement may be no more than moving a few years from ware they ware already setting. But the tape of water or river habitats can be entirely different. At this time the fish are looking for deeper slower spots to hold in. this may be gut of the pools, or deep spots in the runs. Any spot that has some depth, with a soft flow with some sort of broken surface for a roof. Ones we found the right water we now need to adjust our fishing. For the most part we will need to slow down. That is the speed of the drift. The water flow is slow in these spots and the fish are moving and reacting slower to the fly. We will also need to fish these spots more thoroughly. In colder water temperatures, fish will not move as far to take the fly. This is where using a strike indicator will become helpful. Strike indicators will allow you to control your drift and cover the water more efficiently. This has been the first full week of fishing back home in Western New York. It is Brown Trout time ones again. We definitely had an early start to our brown trout run. Despite water conditions, low flows in clear water. The brown trout have been showing up in good numbers. This being said there has been some slow days of fishing. This is mostly due to water temperature. Whenever we have a cold snap, water temperatures take a dive and the Brown trout movement comes to a temporary stop. The good news is that we can project these slowdowns in the fishing by watching the weather forecast. If it’s going to be cold you know the fishing is going to be slow, so we plan accordingly. Flies for the Brown trout, it is an egg fly game. Do to the low water flows we have had the best results with size 10 and 12 egg patterns and colors of orange, Oregon cheese and chartreuse. For the fishing on the Salmon River, the water flows fluctuated only slightly this past week due to a little rainfall. However the water release continues to remain constant at 350 CFS. When the steelhead fishing takes a slight down turn in the fishing activity is due to a cold snap and plumbing water temperature. The slow fishing is only temporary. Once water temperatures improve so will the pace of the steelhead fishing. In general I need to rate the steelhead fishing as very good but technically demanding. This is, if you understand the fish, know the river you will find the steelhead fishing to be good. If not, you’ll find the fishing to be challenge. Productive flies; for the Salmon River, when it comes to egg flies we have been getting the best bites with size 10 egg patterns. However steelhead have been so hot that we are having a hard time holding on to them. As a result we have been forced to size up to a size 8 fly when it comes to fishing egg pattern. For swing flies for the steelhead, we have been able to use a variety of wet flies and intruders. You will find the best swing fishing in the lower river. This is where there is less influence from all the spawning salmon. This past week, was move home week. We closed out the Salmon River portion of the fall campaign. For the next month I will be having Rick Smith do the guide work for me on the Salmon River. Many of you already know Rick Smith as a trusted guide and good friend. We are now fishing the Western New York tributaries for Lake run Brown trout. I will be concentrating on the Brown trout fishing for the next month. However I may be making a few trips to the Salmon River late November. As for the fishing on the Salmon River, the water flows fluctuated only slightly this past week due to a little rainfall. However the water release continues to remain constant at 350 CFS. The water flow this fall has been some of the most consistent water flows I have seen in many years. The steelhead fishing took a slight downturn over the last few days. This down turn in the fishing activity was due to the cold snap and plumbing water temperature. The slow fishing is only temporary, once the temperatures warm up so will water temperatures. Once water temperatures improve so will the pace of the steelhead fishing. 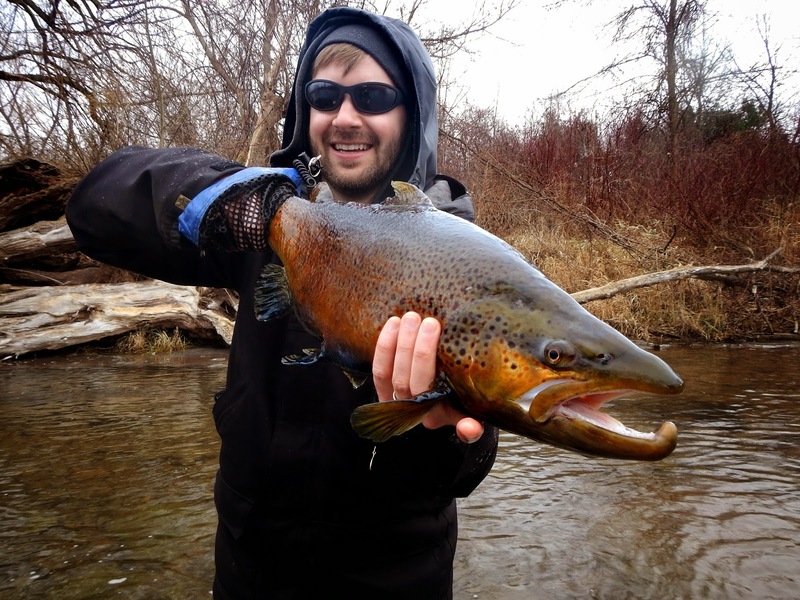 The fishing in Western New York, It is Brown Trout time once again for the western New York tributaries. Despite low clear water flows in all of our creek and rivers, The Brows have made an early showing this fall. We had a slow down in the brown trout fishing late this past week. The slow down in the fishing was due to the recent cold snap. 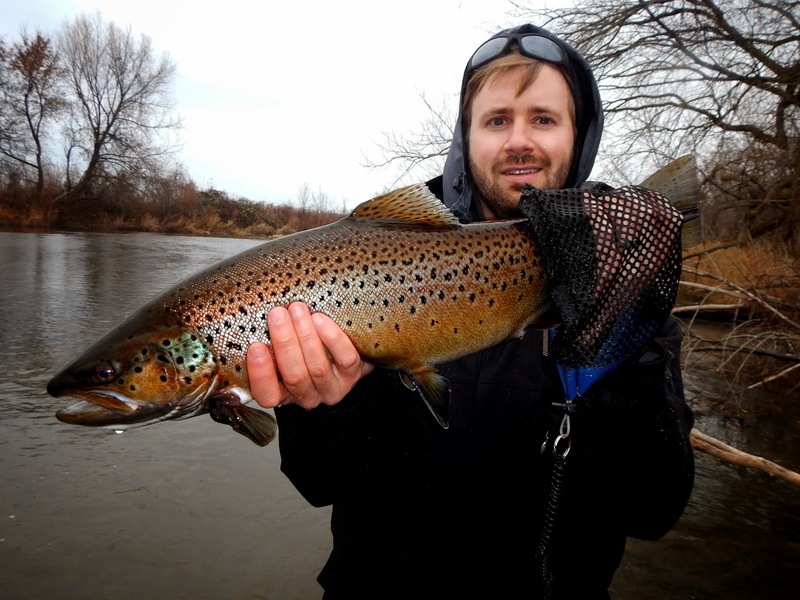 Water temperatures drop below 36°, slowing down the brown trout run in the smaller creeks. Ones the cold snap is over the fishing picked back up. Productive flies; starting with this Salmon River when it comes to egg flies we have been getting the best bites with size 10 egg patterns. However steelhead have been so hot that we are having a hard time holding on to them. As a result we have been forced to size up to a size 8 fly when it comes to fishing egg pattern. For swing flies for the steelhead, we have been able to use a variety of wet flies and intruders. Flies for the Brown trout, it is an egg fly game. Do to the low water flows we have had the best results with size 10 egg patterns and colors of orange, Oregon cheese and chartreuse.